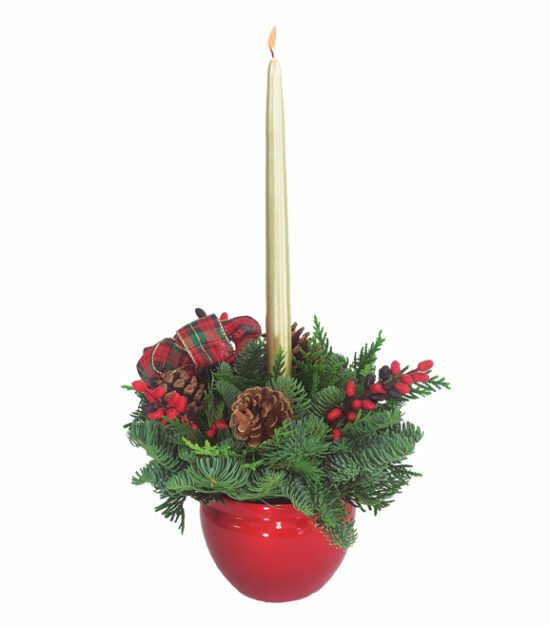 A delightful decoration for almost any room in the house, a fragrant array of greens surrounding a gold taper candle. This combination of Noble fir, Western Red cedar, Princess pine, Natural pinecones, and Faux Red chili berries with a finishing touch of a plaid bow all tucked inside our red lacquer cachepot give hints of shimmering light to any décor. We suggest more than one for larger areas like fireplace mantles or banquet tables. To remove, simply snip wires from the back of the box and lift the item gently. Our fresh designs are originally produced with extra elements so slight shedding is normal. To keep your centerpiece fresh for the longest possible time, you may mist it occasionally with water. The designs are best maintained when displayed indoors, away from direct sunlight, strong heat sources and extreme moisture. The color will soften as the wreath dries. Please pay close attention to the centerpiece when candles are lit.